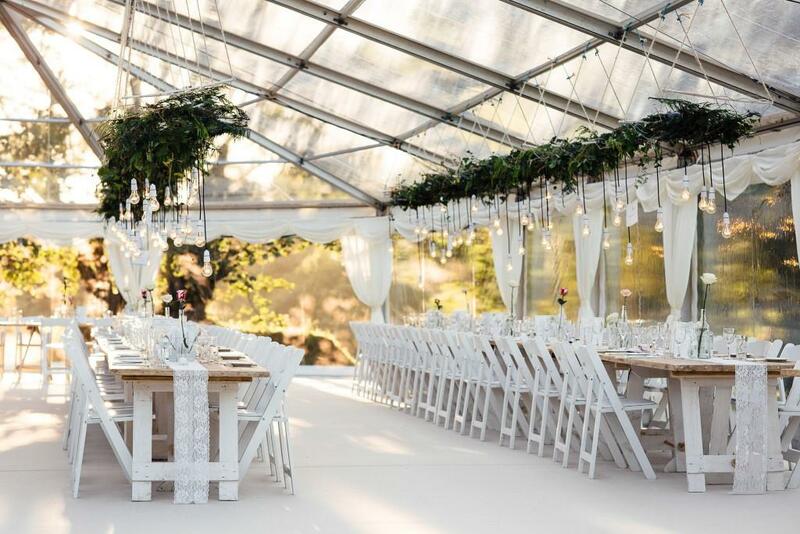 If you need a little help to decide how you would like your wedding marquee to look then let us provide you with some inspiration. There are lots of options to choose from if you have one of our marquees and that’s what makes it so individual. So once you have homed in on , flat or pleated linings, round tables, long banquet style tables, dance floors, furniture, layout, its all about the decorating! But that’s the best bit about a marquee wedding, you get to choose exactly how it looks and you can do as little or as much as you would like. If you find these pictures leave you wanting more then take a look at our pinterest pages where there are loads more photos along with lots of ideas about decorating your marquee. Hatch Marquee Hire is a leading supplier of frame marquees creating elegant and stylish marquees, tailor-made to suit your requirements. 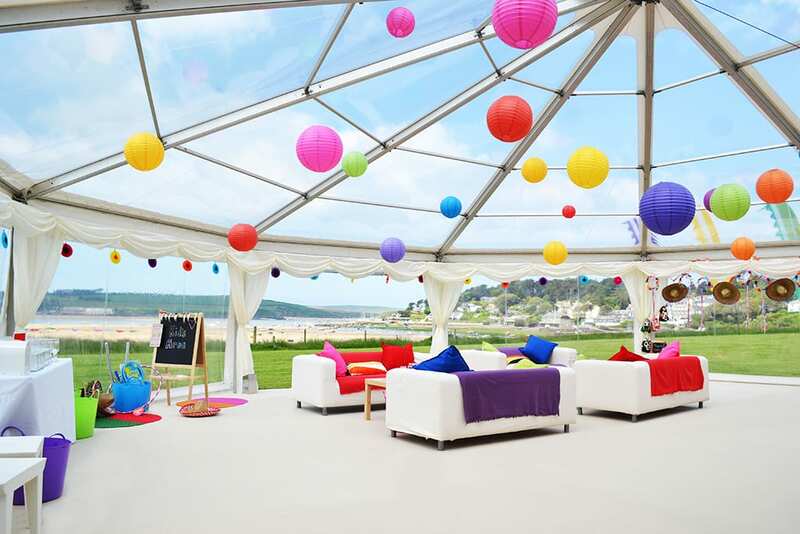 Based in Devon, we are lucky to be able to supply our marquee hire service to some of the most breathtaking locations throughout Devon, Cornwall, Somerset and West Dorset. To find out a bit more information why not complete our contact form and start planning your day. 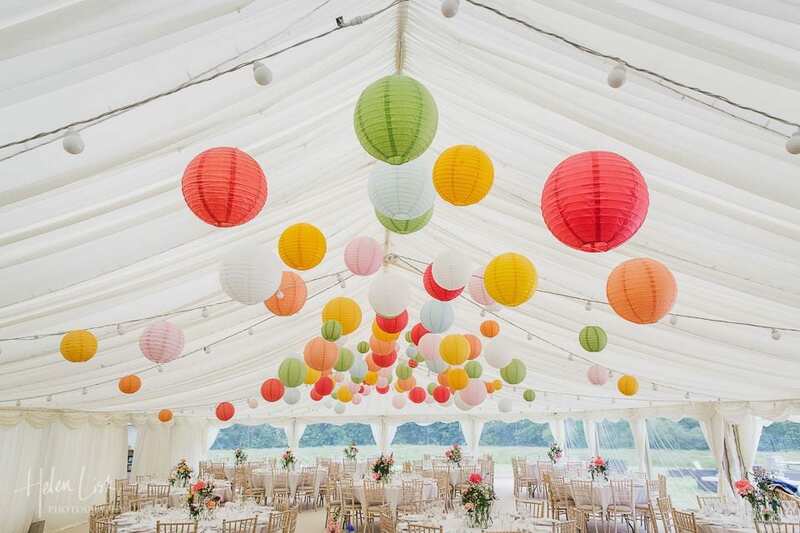 Paper lanterns have grown in popularity in the last few years adding lots of colour and interest to the roof space – whether you use bright colours or pastel shades, big or small, they look great hung at different heights randomly spaced throughout the marquee. 2. You don’t need to confine your flowers to table decorations, these flowers are a lovely feature to welcome guests into the marquee. 3. 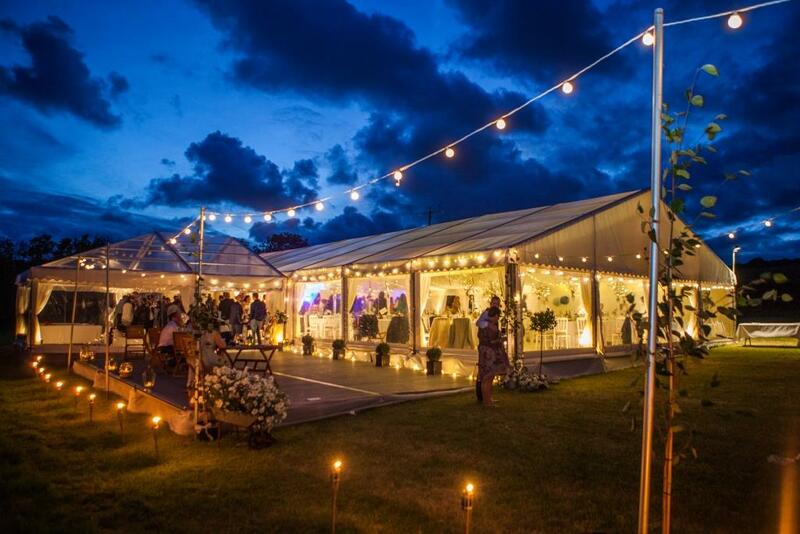 We love the look of this marquee – bunting and flower balls and fairy lights (behind the roof linings) – simply stunning! 4. 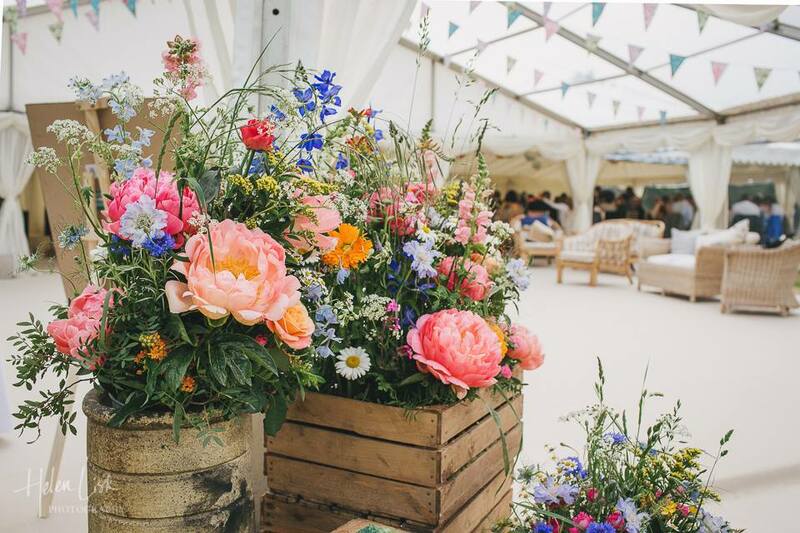 Flowers are the main feature of this marquee, which has a very traditional wedding marquee feel to it – it is one of the most popular pins from our pinterest pages! 5. Use lighting outside to mark pathways, outdoor areas and to add a little atmosphere! 6. Clear roofs can be added over dance floors, the light floods in during the day and by night you can dance under the stars! 7. If clear roofs have caught your eye then why not go all out and have a fully clear roof marquee – absolutely stunning. 8. 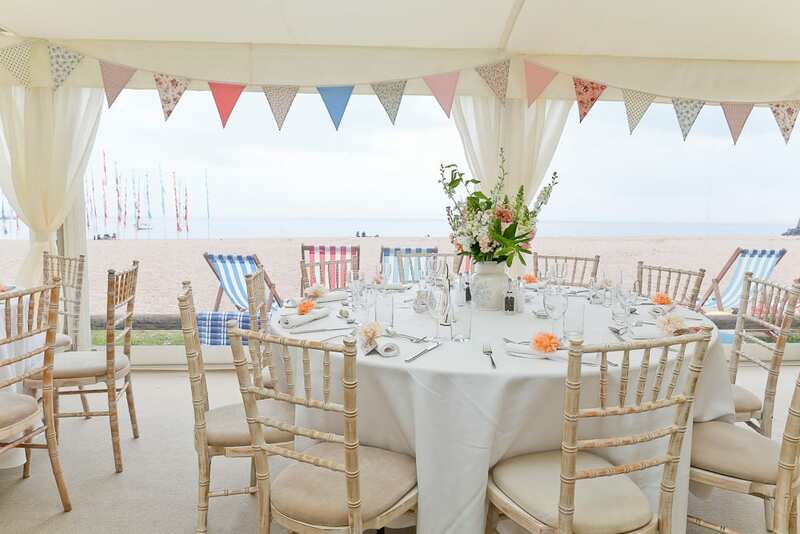 Oh I do like to be beside the seaside – bunting adds that beach side feeling to this marquee. 9. 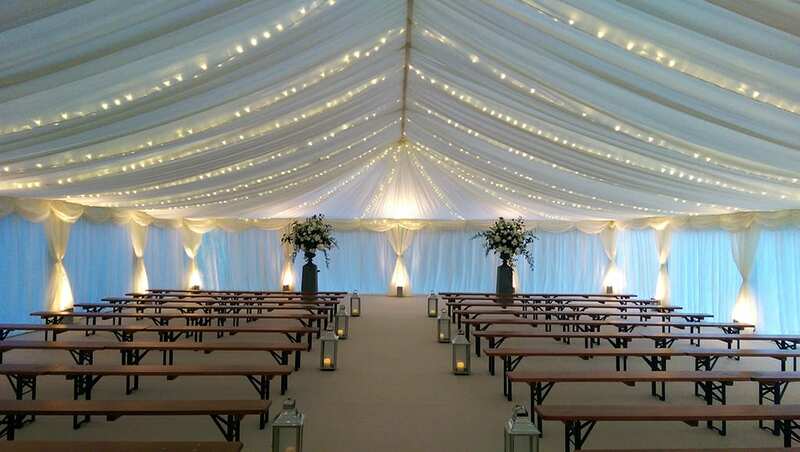 Have a think about lighting you might choose in your marquee…fairy lights behind the linings look great and add a little sparkle to your day. 10. If you have a fab view then make sure you can see it from inside your marquee. Fully clear window walls and clear roofs are fantastic for showing off your surrounding scenery. So now it is your turn…join us in Devon or Cornwall for your special day.